Buggy, a Beacon Avenue retailer of baby stuff, is featured in the P-I today. Nice pictures! I knew they had knitting classes at Buggy, but I did not know they had yarn for sale there. I don’t have a baby to buy for, but I am a knitter, so I may have to check out the woolly merchandise. 1960s postcard sent by the city to warn residents -- thanks Seattle Municipal Archives! Beacon Bits are collections of useful or interesting links that we’ll post periodically. Transit transformation of neighborhood plan? The City is beginning a process of updating most of the 38 neighborhood plans throughout Seattle, but because of the light rail line opening next summer, Beacon Hill, Mount Baker, and Othello have been fast-tracked for station area planning and neighborhood plan updates. And they do mean fast. The stations open in July, and there is some indication that the city wants rezoning of the area done simultaneously with the plan updates. Things may be changing quickly, folks. On Saturday, October 25 at 12:00 noon, the Southeast District Council and the Greater Duwamish District Council are hosting a community event to discuss the new neighborhood planning process and “how to create vibrant, successful neighborhoods at these stations.” The event is at the New Holly Gathering Hall, 7054 32nd Avenue South, and food, beverages, and child care will be provided. Also in the neighborhood planning arena, the city’s Neighborhood Plan Advisory Committee (NPAC) needs four at-large members, “with a good mix of neighborhood knowledge, new passion, and a commitment to healthy communities,” to sit on the committee. The deadline is today, October 17, at 5:00 pm. If you’re interested in helping guide the forthcoming neighborhood planning process as an NPAC member, fill out this PDF and get it in ASAP. Thanks to the SDC and GDDC for the postcard about the event, and the Rainier Valley Post for getting the news out about the NPAC applications. Good Food, a film about sustainable food and farming in the Pacific Northwest, will be screened on Wednesday, October 22, 7:00 pm, at the Rainier Valley Cultural Center on 3515 South Alaska Street. There will be food donation barrels for the Rainier Valley Food Bank; non-perishable food items for the barrels are requested. The screening is free and open to the public, and the filmmakers will attend. United Way of King County is currently recruiting Volunteer Readers to read aloud to children (ages 3-5) one or two at a time (not group reading), at preschools, Head Start classrooms, and child care centers, and they particularly need volunteers in the Central District, Beacon Hill and Rainier Valley. Read to kids, one or two at a time, for one hour each week. Commit to at least six months with the program, preferably longer. Be friendly, energetic, and responsible. It’s the best way to prepare kids for school. It gives kids a love of learning that lasts a lifetime. Visit www.unitedwayofkingcounty.org/readers for more information and to sign up to be a part of our team. All opportunities are between 9am-4pm Monday to Friday only. Sites and shift times are listed on the website above. 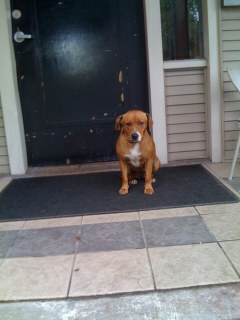 Is this your lost mama dog? The Jungle and the East Duwamish greenbelt have a notable (one might say infamous) impact on public safety in the west Beacon Hill area. Interested in the future of this area? Plan to attend a meeting this coming Tuesday to discuss creating a permanent public safety solution for the area. The meeting is October 21, 7:00 pm, at Quarters 1, PacMed Campus, on the northwest corner of 14th Avenue South and South Judkins Street . Those attending will include Washington State Representative Sharon Tomiko-Santos, Lorena Eng of the Washington State Department of Transportation, and representatives from the City of Seattle Department of Transportation, Department of Neighborhoods, and the Mayor’s office, as well as directors from the Mountains to Sound Greenway Trust and others. Thanks to Craig Thompson for the info! 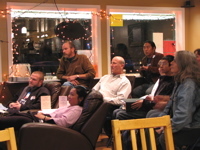 People intently watching the presidential debate at Grown Folks Coffee House, 10/15. Photo by Jason. A few days ago we posted about the debate viewing party at Grown Folks. We were there tonight for the debate, and it was fun, though I’d say the crowd was a bit more subdued than I expected. (There was some heckling, booing, and cheering, though!) This was our first visit to Grown Folks, and we had some very tasty sandwiches. They will be hosting election returns viewing all day on Election Day, so maybe we’ll be back. This is an interesting question. Why is Beacon Hill divided into three parts on the city’s neighborhood map, informal as it may be? Unlike Mike, though, I wonder why it’s not divided even more. The Hill is huge. Look at a Seattle map. Beacon Hill is too big to be one neighborhood–it’s really a meta-neighborhood, a large area containing several smaller neighborhoods. 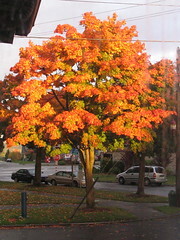 North Beacon has its own personality that differs from South Beacon and Mid Beacon. Each area has concerns that the others do not have. For example, North Beacon has sidewalks almost everywhere. South Beacon… not so much. So it makes sense that South Beacon would have sidewalks as a priority, while people in North Beacon would prioritize other things. A successful, sustainable neighborhood is, ideally, defined by a five-minute or 1/4 mile walking distance from center to edge, and being relatively self-contained and walkable. It would contain about 5,000 residents, and local schools and businesses to serve them. Basically, it’s an area that is small enough that people can easily access local services within the neighborhood, while being large enough to support those services. (It sounds a little small by sprawling modern Seattle standards, but small neighborhood units like this used to be in place here. Look at any old Seattle neighborhood that was built-up before the 1930s, particularly along one of the old streetcar routes, and see how every half mile or so there is a small clump of old commercial buildings, now mostly used as residences. The rise of the car and modern zoning practices have killed a lot of the old neighborhood business districts.) Incidentally, this is approximately the same size as a census tract. Look at a map: a walk down Beacon Avenue from north to south is more than five miles. To get some perspective–as the crow flies, five miles north of the North Beacon business district “junction” is the University of Washington. Five miles east is Mercer Island. Five miles west is Alki Point. Five miles northwest is Queen Anne. All very different places from Beacon Hill. You can see that Beacon Hill is a pretty huge area! Even dividing it into three zones gives you three “neighborhoods” that are larger than the ideal neighborhood unit. Each area is going to have its own unique concerns and issues (for example — people in the area near Beacon and Stevens care about what happens to the Stevens Place (Triangle) Park on Beacon, but people who live three miles south on Beacon don’t have any particular interest in that issue), and I don’t believe that recognizing that is a bad thing. I think even smaller neighborhoods on Beacon Hill would be useful, if it meant that we had more of a “community” within our neighborhoods. Folks in South Beacon already feel somewhat marginalized by the focus on North Beacon, and eliminating divisions within the Hill would probably worsen that perception. Please tell us what you think by commenting here on the blog.